Christmas is almost here and it is natural that we also expect wonderful holiday and atmosphere around us, because it is time to celebrate, right? 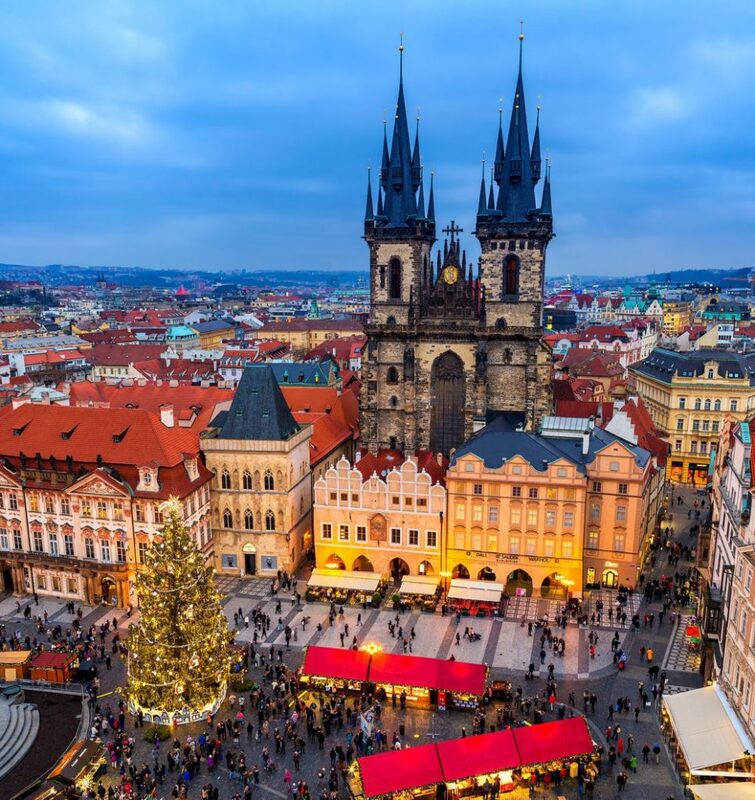 Prague has been designed for trips during and in the Christmas period. 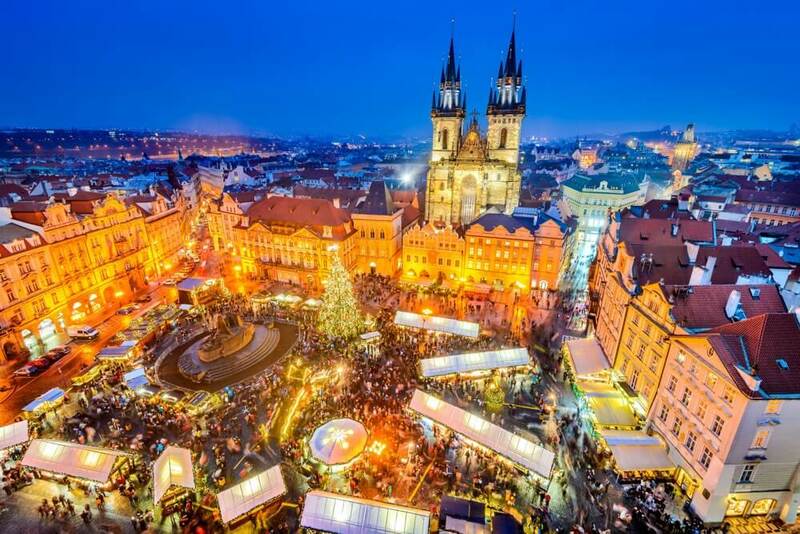 In addition, CNN listed Prague’s festive markets as one of the best in the world. What to expect from this magnificent city over Christmas? Traditional markets, rustical pubs, romantic walks and unique and intense moments. Check our short Christmas baedeker over Prague. Enjoy the reading and get the inspiration. Birthplace of Franz Kafka breathes out magic atmosphere. Whether it is architecture, history, cultural life, as Czech always say – “V Praze je blaze” (Everything is great in Prague). And over Christmas, these aspects are even more visible, and they create the unique place to visit in this time of the year. Prague is a city of opportunities and important events. Even if you take a couple of days off by the end of the year, there is no chance to discover and explore it thoroughly; there is for sure no chance to do it in one single trip unless staying for a very long time. During holidays everything is vibrant and intensive, nobody gets bored. One activity after another and to enjoy all of them, you have to choose carefully what you like because you probably cannot manage everything. Last but not least there is also a practical reason behind. Prague is compared to the other European cities, still considered to be cheap, so you do not need to be a millionaire to visit this great city. These are all pros’ in favor of Prague, but be honest – was there anybody even not thinking to visit this beautiful place? 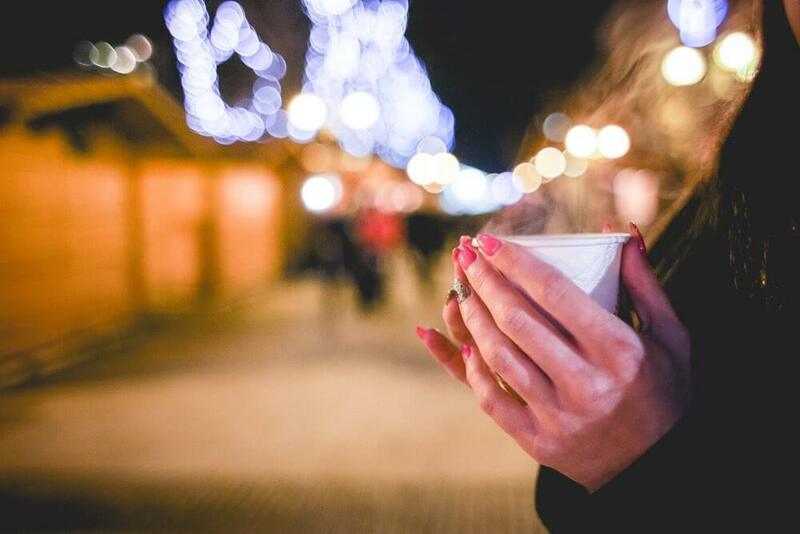 People, aromas, tastings – Christmas markets! There is no holiday trip to be considered complete if you do not visit Christmas markets in Prague. There are many to choose from. The greatest ones have something in common – they open December 1 and are well known due to their festive atmosphere. The most famous Christmas market is the one located at Old Town Square. Hard to be also missed from the further distance due to giant Christmas tree that is year by year its dominant. Are you hungry, thirsty or just curious? There is something for every visitor. Would be considered a big miss to visit Prague over Christmas and do no stroll through this magic place. Wenceslas Square is also a perfect venue to find the charming markets. A little bit smaller though compared to Old Town Square, the atmosphere is the same, if not even better. Mulled wine, tasty sausage and places that played an essential role in the past days. When visiting Prague Castle, you will be stunned by culture; markets are to be open here already on November 25. Traditional handicrafts, refreshment stalls and a real Christmas atmosphere everywhere. Imagine – all of this in the largest castle complex in the world! 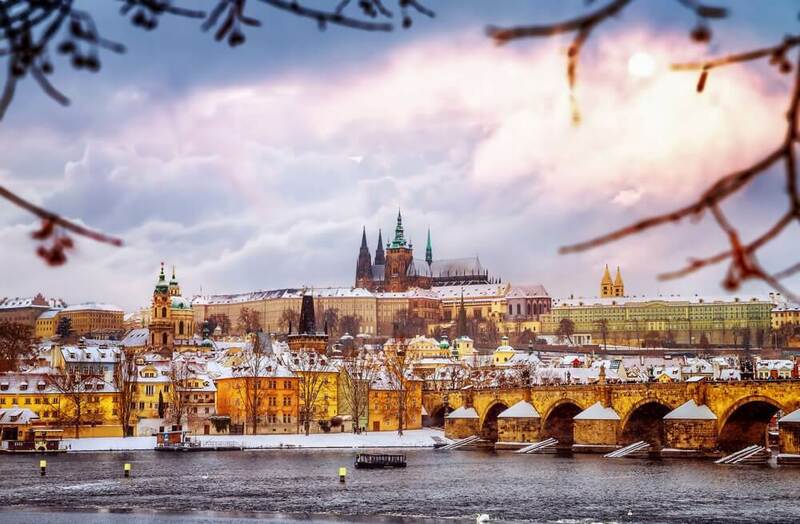 What are the options in winter Prague? Prague is super enjoyable especially over holidays for couples in love. 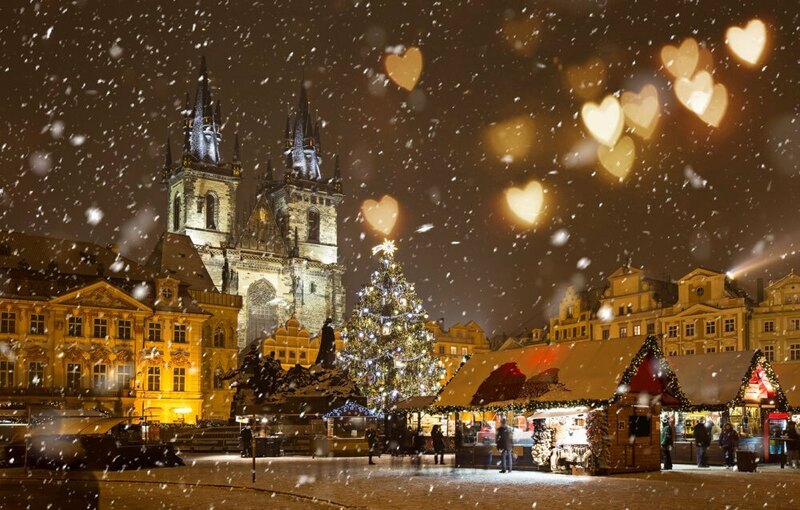 ”City of hundred spires“ is full of romantic narrow streets and places full of love, especially over Christmas looking like typical venues for sweet romantic movies. Worth your visit is also Charles Bridge, the oldest bridge in Prague. In the dimmed lights you already feel the statues waking up slowly and walking from one end to the other is an incredible experience. The very similar atmosphere also rules a famous island in Prague – Kampa. Walking close to Vltava river would never be more romantic than now when we celebrate the most beautiful holidays of the year. Prague is also loved due to its magnificent views. Our recommendation is Letná, especially if you want to enjoy how does it feel like to be part of the picturesque postcard. Unforgettable view over snowy roofs is also worth from Vyšehrad, Vítkov or Havlíček Gardens. Get yourself caught into the opulent atmosphere of Vrtbovska Garden and palace with the same name. If you are fancied by the baroque period, this is a place to be. After losing so many calories by walking and freezing in the cold, it is time to recharge and warm up the body and soul. It is a difficult task to pick up just one place, but one thing is true – Prague traditional pubs always provide the best draft beer and large portions of traditional dishes. 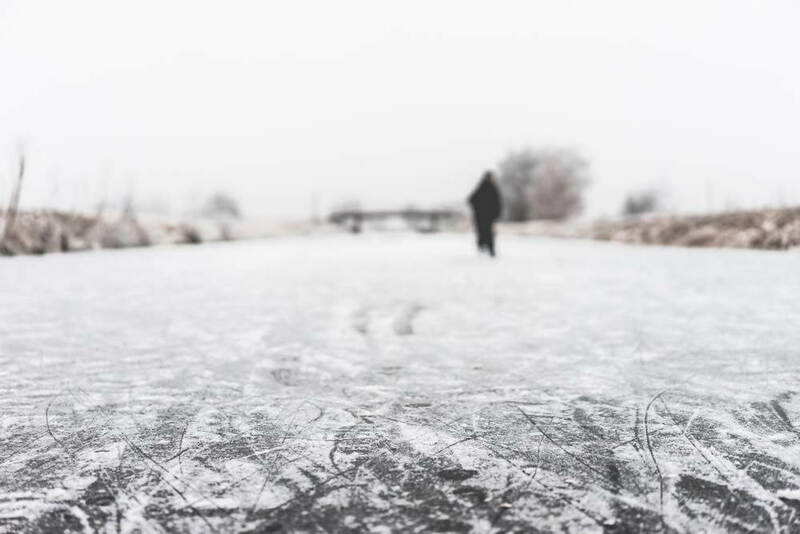 There is no winter without ice skating, right? If you are by any chance in Prague over the holidays, and you would like to feel the wind in your face, there are many places to go and practice your Rittberger or Flip. There are many public ice skating rinks in Prague, whether covered in stadiums or outside areas. Worth to be mentioned are Ice Arena Kobra or public playground Na Františku. Do you like to immerse into the culture and history? Good news for you, museums and galleries are open also during holidays. Admire musical heritage in Czech Museum of Music, but if you are more into fine arts, definitely visit Mucha Museum Prague – a museum dedicated to world known secession painter. London has Madam Tussauds, Prague has Grévin – this wax figurines museum share the exposition with Chocotopia – exposition devoted to sweets. What a catch! As you see, the list of activities over holidays in Prague is endless. For small travelers, there is an option of Zoo, also an excellent choice for fauna lovers. If you prefer flora, visit Botanical Gardens, even open on Christmas Eve. For those of you who believe, there is a special place to visit for your midnight mass, ancient and quaint St. Vitus Cathedral at Prague Castle. 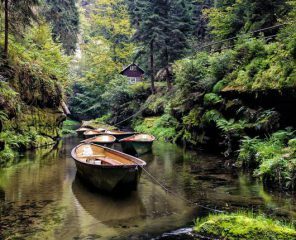 After a couple of mulled wines or walking in Prague, we also sometimes long for a break from the hustle of the big city, nature would be our next choice. 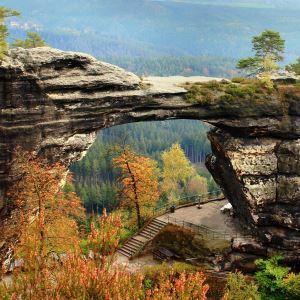 In less than 2 hours you could be in an area known as Bohemian Switzerland. Imagine stunning views and with a pleasant weather also almost kitschy sunset in the fairy tale countryside. 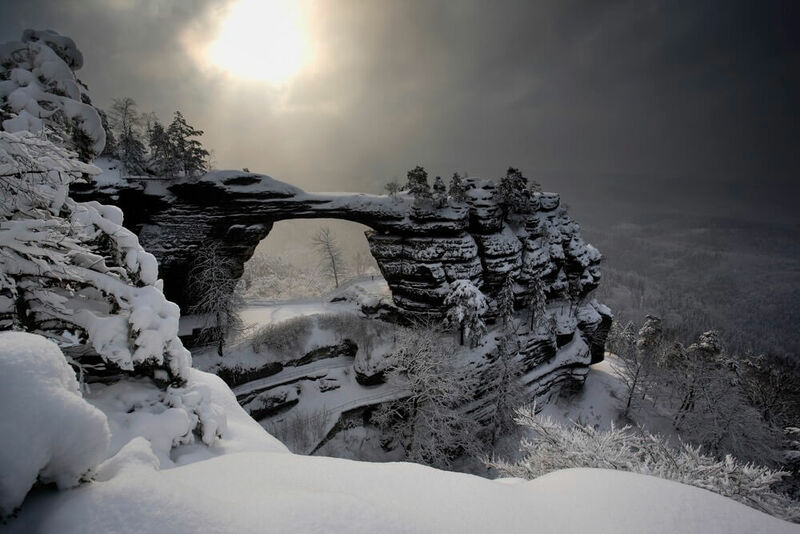 It was probably also the reason why the filmmakers chose this locality as shooting place for winter scenes for The Chronicles of Narnia movie. 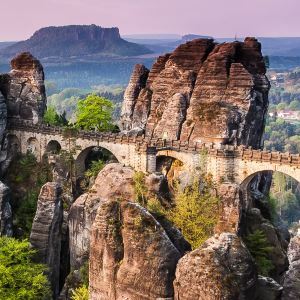 A trip to the Tisa Rocks Labyrinth and Bastei Bridge will take you to two countries on a full day trip. Enjoy the walk around tall sandstone towers, through narrow passages and small caves. 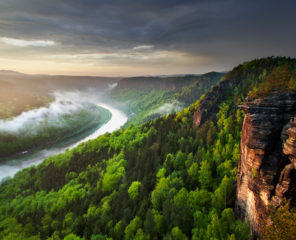 From Bastei Bridge expect to view breathtaking landscape formed by the biggest sandstone canyon – The Elbe Canyon. 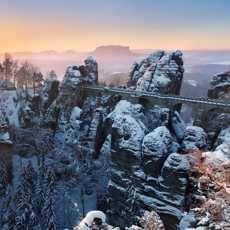 Another option is to explore two highlights of Bohemian Switzerland – Pravcicka Gate and Bastei Bridge. It’s a comfortable full day trip which is also doable in winter. 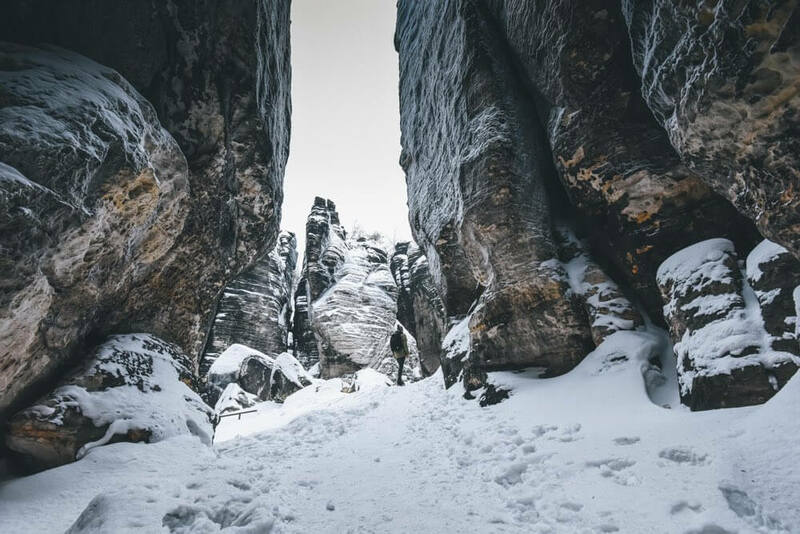 Rock formations and high stone walls are creating iconic scenery and offering a perfect spot for scenic views. 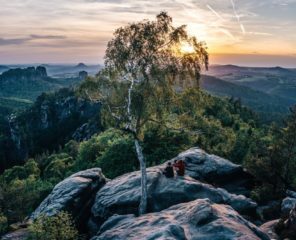 So, who is up to join us and experience a magical one-day hiking tour outside Prague?